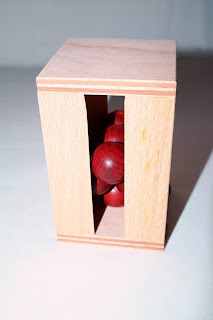 From the creators of puzzles such as Puzzle Pod Cryptex (previously reviewed) and Vino Vault, comes a new puzzle for all gift lovers out there. 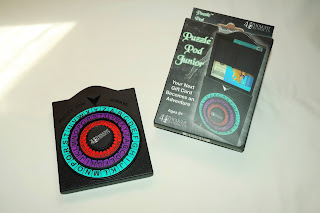 Puzzle Pod Junior offers a fun and interesting way of getting your loved ones a thoughtful gift with an adventure attached to it. 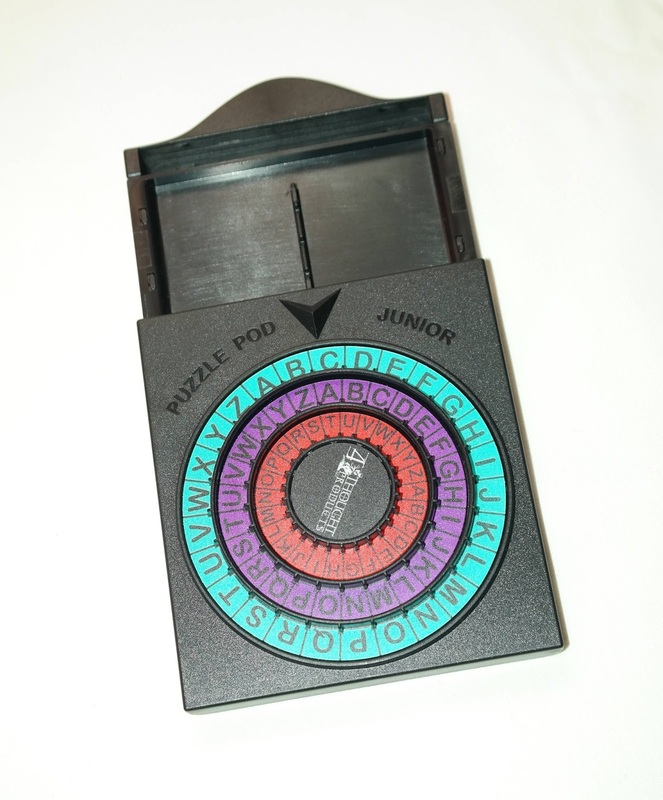 For someone who's not very creative when it comes to gifts, the Puzzle Pod Junior is the perfect way to overcome that. Offering money or a gift card is a nice way of giving the other person an option to get what they wanted without running the risk of disappoint them. 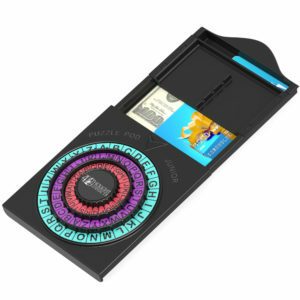 What better way to do that than enclosing the money or a gift card with the Puzzle Pod Junior? The puzzle is pretty small compared to the original. It measures about 10.5 x 9.5 cm (4.13" x 3.74"). While the original was used for small objects, this one is specifically used for money or gift cards: basically, anything that fits inside the small compartment (8.3 x 10.2 x 0.2 cm or 3.27" x 4.02" x 0.08"). The puzzle unlocks by rotating the three discs so that the three key letters are aligned with the arrow at the top of the puzzle. When that happens the back of the puzzle slides off as a drawer, showcasing its contents to the deserving enigma solver. 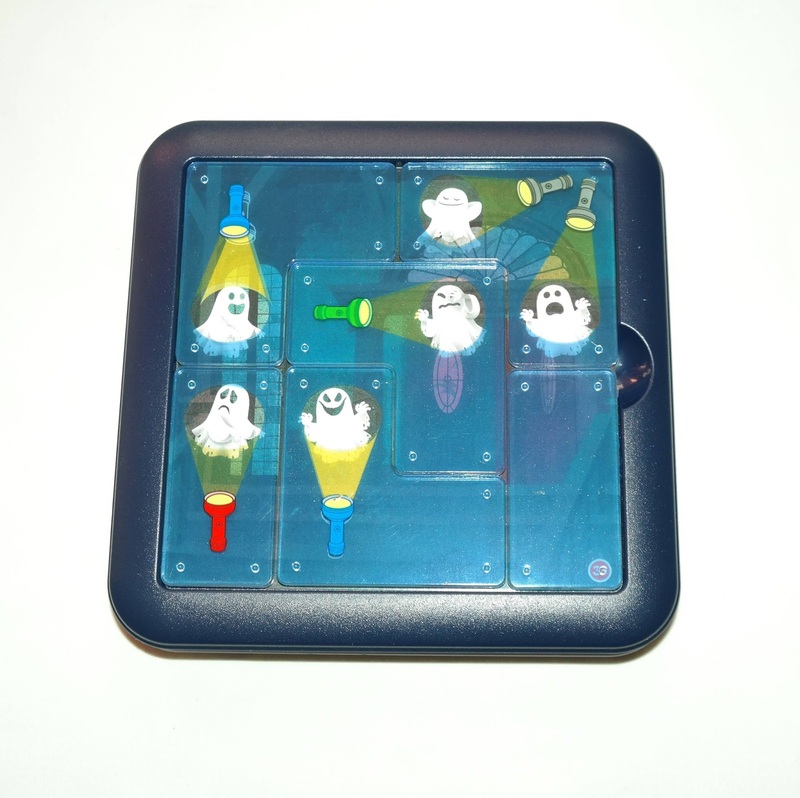 The idea of this puzzle is similar to the original Puzzle Pod, in that you set a keyword that unlocks the puzzle and its contents for the person you're giving the gift. The key is any three-letter word you can think of, but it's not limited to three letter words. You can use three words and set the key to the first letter of each word, or the first three letters of a bigger word, or assign letters to numbers from an equation. You see, there's a myriad of options, only limited by your creativity. 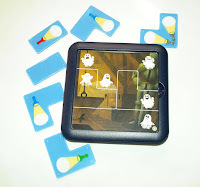 When you have your keyword ready you can then set the provided stickers accordingly to the puzzle and lock it. All you need now is to give some clues to the recipient of the gift and see them struggle to solve the cryptic puzzle. The only drawback from this puzzle is that, unlike its predecessor, there's no easy way to reset it. It can only be used once, since the stickers are very hard to pull off once they're on the puzzle. While it's true that the puzzle only serves one purpose for the person who's giving the gift, it could be recycled, as the gift recipient could've use it again to offer something to another person. One could use the same clues or new ones for the same keyword, though. 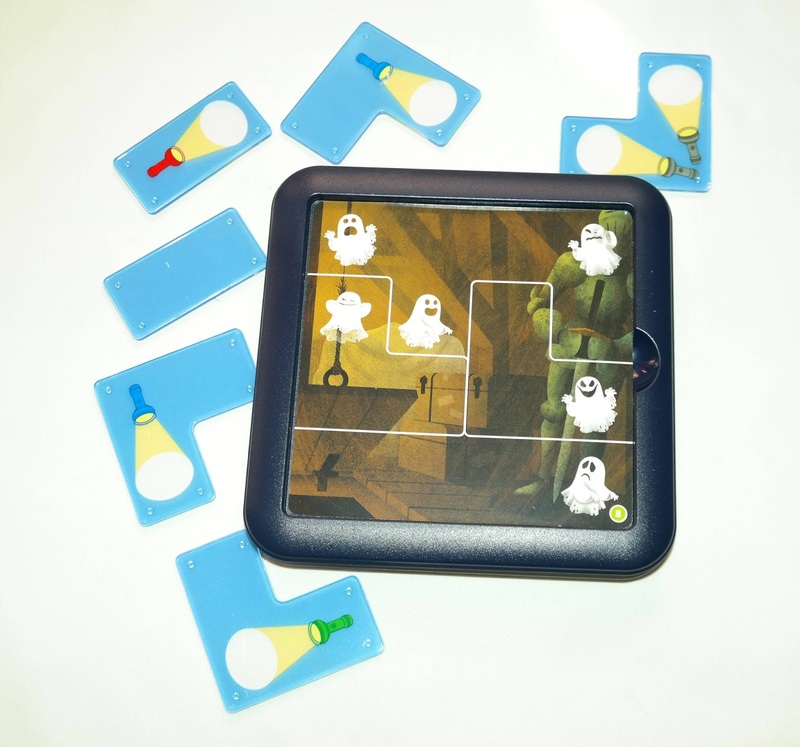 While in practice it can only be used once, the Puzzle Pod Junior is perfect for offering money or a gift card, instead of just being another dull or a banal present. 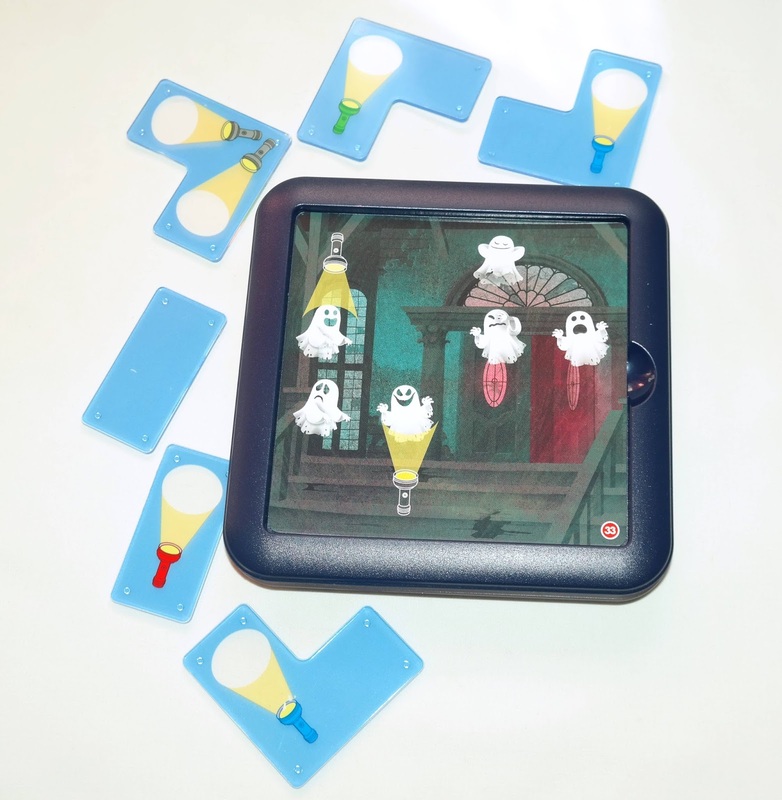 The puzzle provides the gift giver and recipient a way of engaging in a creative and fun adventure of puzzle deciphering, which would be something difficult to accomplish otherwise. Made with the same high quality and effort SmartGames puts in all their products, Ghost Hunters promises a scary but fun ghost-hunting adventure. 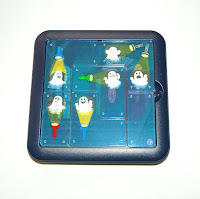 Presented in their new packaging, which is more practical and travel-friendly, the game shines with personality. The artwork is cartoonish, light-hearted, and the pieces have this translucent effect that enhances the visual effect the flashlights have on the ghosts. It's really well thought-out to the tiniest detail. The game is pretty simple to understand. There are 30 challenge cards, each with a challenge on both sides, which makes a total of 60 different challenges with four levels of difficulty. The higher the number on a challenge card the harder will be to solve it. 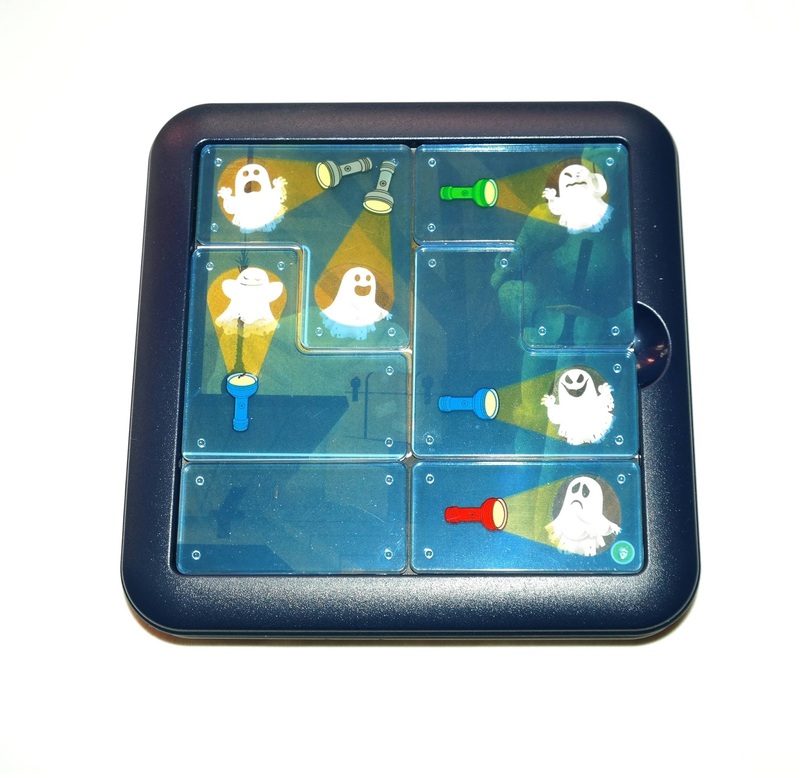 There are only six pieces that fill the entire game board (4x4 grid), but the difficulty of this game is not filling the board with the pieces, it's how you do it by following a small set of rules: each piece contains at least one flashlight painted on one side, meaning you can only use that side for the solution; you can successfully capture all ghosts in a given challenge by strategically placing the pieces so that the transparent circles of the light beams cover every ghost; if there's any ghost left covered by the blue part of a puzzle piece or the flashlight design itself, you're doing it wrong. 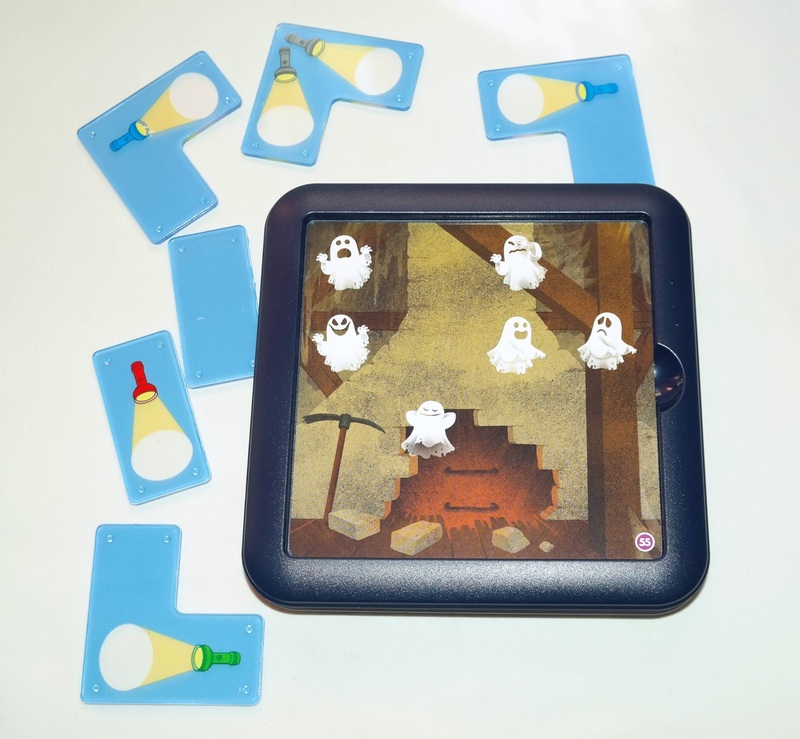 As usually, the game starts with some challenges that are very easy to solve, to get you acquainted with the game's rules. This means that most pieces' outlines in the starter challenges will be visible, telling you the shape and position of the pieces. 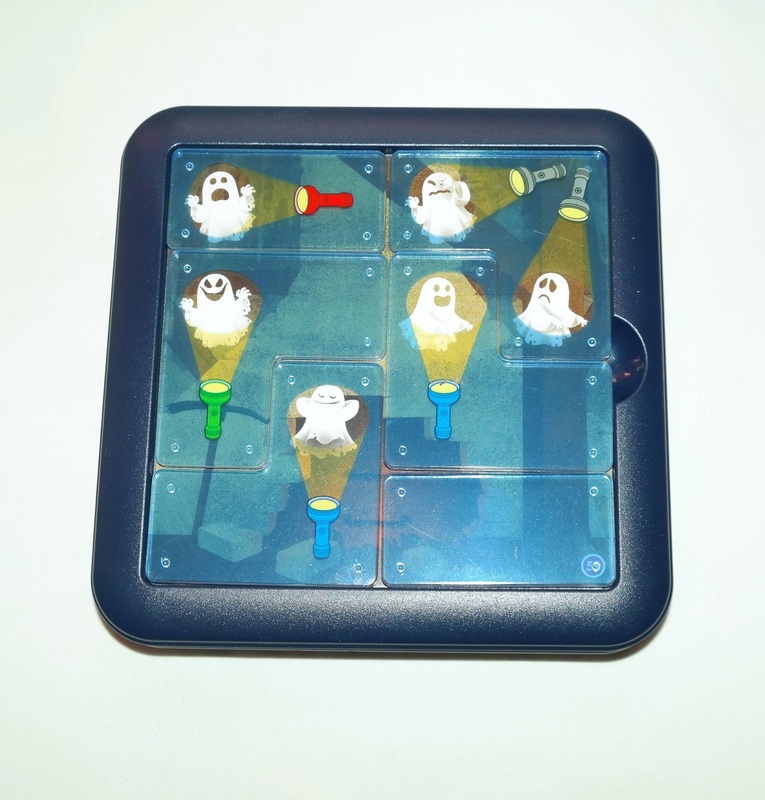 Later challenges will only reveal colored flashlights but not the outline of the pieces. Some will only show the flashlights but not their actual color, just position and orientation. 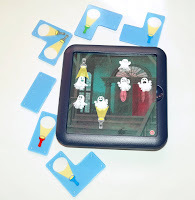 But the most challenging ones will only show the actual position of the ghosts. You will have to figure out the rest all by yourself. These are the ones that will put your solving skills to the test, and also your patience. Essentially a packing puzzle with some elements of pattern recognition, this game however, is much more than the sum of its parts. It's a journey of discovery, with many satisfying moments, especially when you finally catch the last ghost of any given challenge. It's quite a fun experience, whether you're a 6 year-old kid or a young at heart 106 year-old chap. It's highly recommended for the whole family. 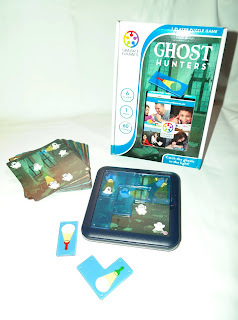 Availability: You can find the Ghost Hunters game at PuzzleMaster for $22.99 CAD. 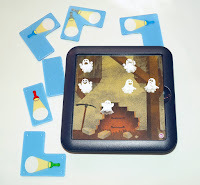 Check out other fun games by SmartGames as well. 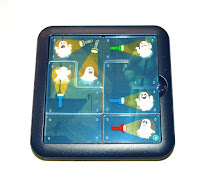 They have many different games that will delight any puzzle enthusiast. 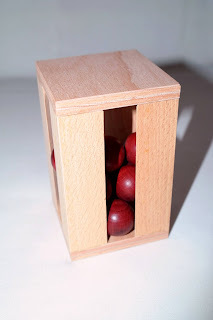 If you've been following my blog posts for a while, you probably know that Vinco is among my favorite puzzle designers. His puzzles are made with the best quality wood materials and the finish work he applies to all his puzzles is top notch. If there was ever a reason to visit the Czech Republic, Vinco is certainly a very good one. Tetrahedron in Cage is Vinco's take on a classic design by Stewart Coffin, the Ball Room. This is a very interesting design made with two contrasting wood types, one for the outer frame and the other for the actual pieces. It measures 10 x 6 cm (4" x 2.4"). 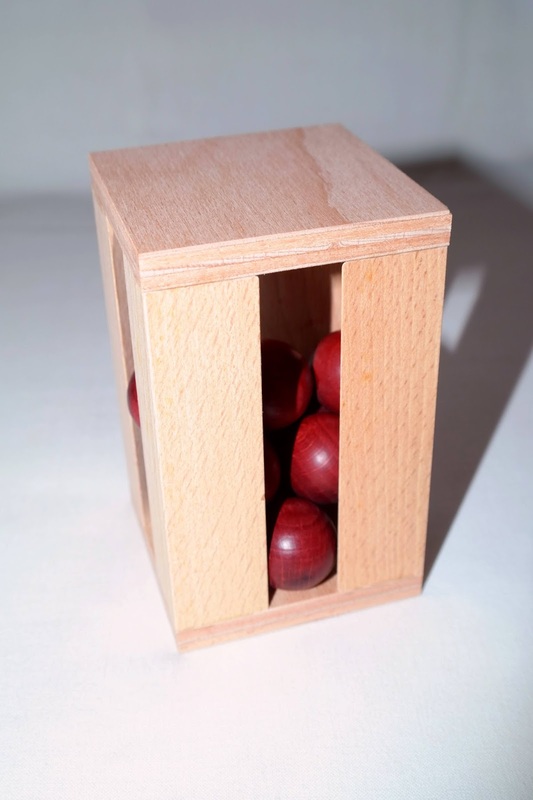 In the original design you had four pieces made with spheres glued together in different arrangements. The idea was to build a pyramid with those pieces so that it could fit inside a square box. In this version, however, Vinco takes it one step further and makes the puzzle with only three pieces (or is it backwards?). But that's not all...Instead of having a box where you can freely touch the pieces, Vinco made a cage with the pieces already inside, and with little room to wiggle. Vinco rates this as a difficulty level 4/5, and I completely agree. It's a little challenging to solve. You can separate the solving process into two steps: first you have to figure out how to build a pyramid out of those three different pieces. When you do, you have to actually build the pyramid with the very limited space inside the cage, since you can't take the pieces out. The openings in the sides are all you got to work with. Also, the pyramid won't fit with its base on the bottom, so you also have to work out the actual orientation, and that's maybe the most difficult part of the puzzle. Tetrahedron in Cage is a very clever design by Vinco that shouldn't be missed. I like how it requires a different way of thinking and it messes with your spatial awareness. Definitely recommended for anyone who likes a challenge. Availability: Tetrahedron in Cage can be purchased at Brilliant Puzzles for just $16.95 USD. Many other designs from Vinco are available.